We live in a beautiful world, and Reid Gower wants to make sure we know it. Gower spent six months creating this beautiful time-lapse video, shot in five U.S. states and seven other countries, including Austria, Hungary, Turkey, Poland, Germany, Canada and the Czech Republic. While on an expedition to Alaska that was run by GoPro and Project Aether, Gower was able to capture the footage from near-space using a GoPro camera housed inside a thermal lunchbox with handwarmers and a GPS attached to a balloon. Most of the footage, however, was shot with a more standard Nikon DSLR. Taro Matsumura captured this image of a holy site in Japan. Emma photographed this amazing contrast on the horizon. Another ocean sunset, from Yann. Stunning colors, by Andrej Ravnikar. Chris Ortiz sent this meta-horizon. Trevor Smith sent this image of an urban nightscape. Egami Obscura took this shot from “the top of the Rock” in New York City. Night sky observers around the world will have the chance to see a special full moon — one that has been dubbed a “blue moon” — on Aug. 31. But, even those who are thwarted by less-than-ideal conditions outside will be able to tune in online to see spectacular lunar views. The web-based Slooh Space Camera, which showcases live views from various telescopes around the world, is hosting a special broadcast of the blue moon on Friday, beginning at 6 p.m. EDT (2200 GMT). Slooh’s program will feature live shots of the moon from an observatory in the Canary Islands, off the coast of Africa and views of the sun from the Prescott Observatory in Arizona. The dual feeds will treat viewers to simultaneous real-time observations of the moon and sun in true color, Slooh officials said. The broadcast will also pay tribute to the life of astronaut Neil Armstrong, the first man to walk on the moon. Armstrong died on Aug. 25 at the age of 82, following complications from heart surgery. Astronomer Bob Berman, Slooh editor and a columnist at Astronomy Magazine will be joined by Duncan Copp, the filmmaker and producer behind the acclaimed documentary In the Shadow of the Moon, to discuss Armstrong’s life and NASA’s Apollo moon program. The blue moon webcast can be accessed by visiting the Slooh Space Camera’s website. Viewers can also tune in on their IOS or Android mobile devices, according to Slooh officials. This week’s blue moon will be the last one visible until July 2015, Slooh officials said. Interestingly enough, the term “blue moon” does not refer to the moon’s color, but rather has to do with it being the second of two full moons within the same calendar month. 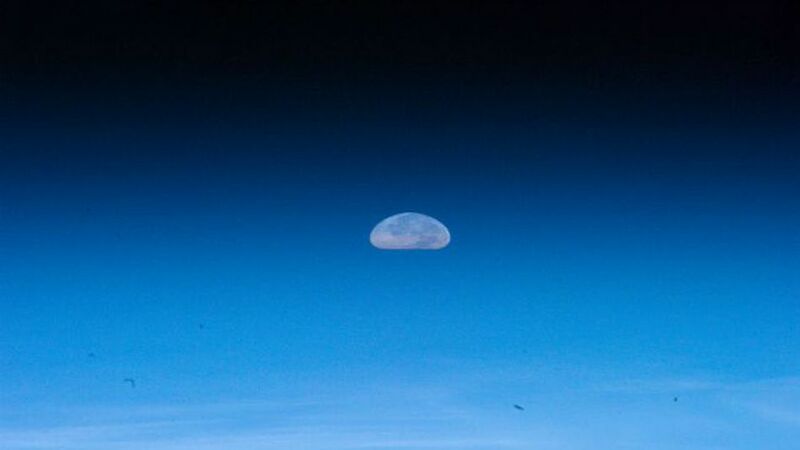 The definition of a blue moon, as we use it today, was actually the result of a mistake. Long ago, the term “blue moon” was used to describe absurd happenings. In 1946, amateur astronomer James Pruett misinterpreted the term as it was used in the Maine Farmers’ Almanac. Pruett penned a piece for Sky & Telescope magazine with the incorrect assumption that a blue moon refers to the second full moon of a month with two (rather than the third full moon in a season that has four of them, as was written in the almanac). The first full moon of this month occurred on Aug. 1. Typically, blue moons occur every 2.7 years, and while they do not differ much from other full moons, the lunar views on Friday should serve as a fitting tribute to the legacy of Armstrong and the Apollo program. An artist’s concept of a small planetary system. 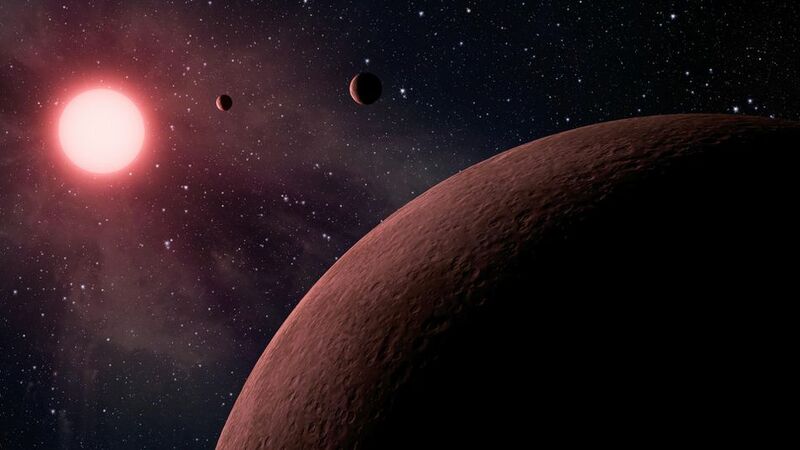 Astronomers using data from NASA’s Kepler mission and ground-based telescopes recently confirmed that the system, called KOI-961, hosts the three smallest exoplanets known so far to orbit a star other than our sun. Astronomers now have a powerful new tool to sniff out methane on alien planets. The organic molecule, considered one of the building blocks of life, could be key to finding organisms beyond Earth. Using supercomputers, a team of scientists developed a new absorption spectrum for methane that’s 2,000 times more comprehensive than previous models and can detect the molecule at temperatures up to 2,228 degrees Fahrenheit, higher than ever before. “We’ve probably been waiting for this paper for 10 or 20 years,” said MIT astrophysicist and exoplanet hunter Sara Seager, who was not involved in the study. Different molecules absorb light in different, telltale ways. When astronomers look at how the atmospheres of exoplanets absorb starlight, they can compare it to a spectrum to identify which molecules these alien worlds are made of. But previous methane spectra left out a range of absorption lines, especially for high temperatures, because no one had undertaken the immense task of calculating how the molecules would absorb light in higher energy states, Seager told Space.com. The new calculations, led by Sergei Yurchenko, a professor physics and astronomy at University College London, resulted in a list of nearly 10 billion spectroscopic lines, each representing a distinct color at which methane can absorb light. Their findings were detailed June 16 in the Proceedings of the National Academy of Sciences. To complete the task, they used some of the most advanced supercomputers in the United Kingdom, provided by the University of Cambridge’s Distributed Research utilizing Advanced Computing (DiRAC) project. The team believes their model could give scientists a more complete picture of the methane abundance on failed stars known as brown dwarfs and alien worlds. For example, Yurchenko and colleagues found that the so-called “hot Jupiter” HD 189733b — a well-studied, blue-colored exoplanet 63 light-years away from Earth — might have 20 times more methane than previously believed. But methane is just one component of this alien planet’s hellish atmosphere, so the finding doesn’t necessarily change the current picture of HD 189733b, where temperatures climb as high as 1,700 degrees Fahrenheit (930 degrees Celsius) during the day and rain comes in the form of molten glass. While methane can be produced by geologic sources, the organic compound also could be a sign of biologic activity. That means finding methane in a planet’s atmosphere could be a potential sign of life. Astronomers don’t think they’ll find life on a hostile planet like HD 189733b, but with current technology, scientists are often stuck looking at these hot worlds, Yurchenko said. Hot Jupiters are relatively easy to detect because they are huge planets with tight orbits and they block a large portion of light when they pass in front of their parent star. HD189733b, for example, causes a three percent drop in starlight. Yurchenko said astronomers likely need better detection methods before they can analyze the atmosphere of alien planets in the habitable zone, where water and life could possible exist. “But if we learn something now about these hot objects that we can observe, then we could get a better idea of the objects that are still to come,” Yurchenko added. Yurchenko said he is looking forward to the launch of future missions, such as the European Space Agency’s Exoplanet Characterization Observatory, or EChO, and NASA’s James Webb Space Telescope, which might produce better data about a wider variety of alien worlds. Yurchenko said more research could be done to expand the model to include absorption lines for methane that’s at even higher temperatures. His team is also working on expanding astronomers’ spectral range for about 30 other molecules. Imagine waking up just after midnight to a sky so bright you swear it must be early morning. 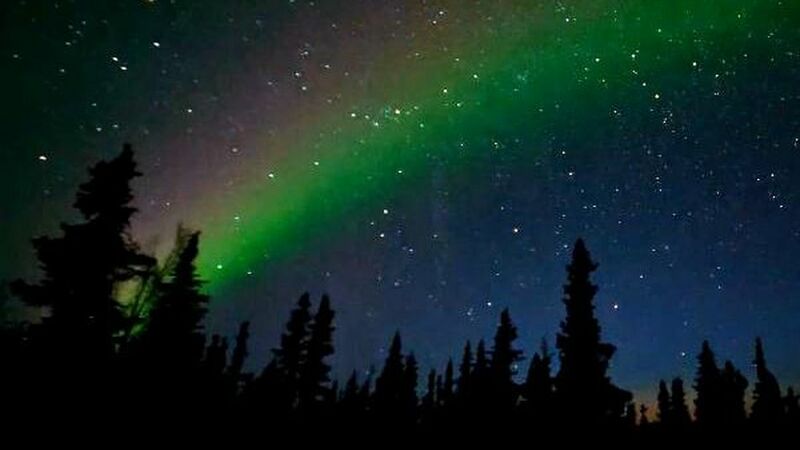 Imagine seeing the Northern Lights as far south as Cuba or Hawaii. 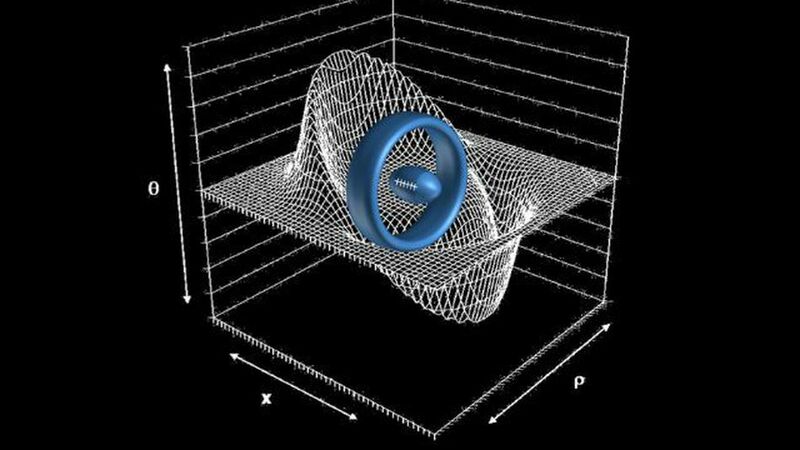 Imagine that the same phenomena behind both has also generated electric fields in the ground strong enough to power small electronics. That’s what happened in 1859, when the earth was struck by the most severe geomagnetic storm ever recorded. Forget asset bubbles, recessions, or hurricanes—space weather could prove far more economically harmful. A severe geomagnetic storm—a sudden, violent eruption of gas and magnetic fields from the sun’s surface—could prove particularly devastating. If the 1859 storm, known as the “Carrington event,” were to recur today it could cause trillions of dollars in economic damage and take years to recover from, according to estimates. The sun would sneeze and the economy could shatter. 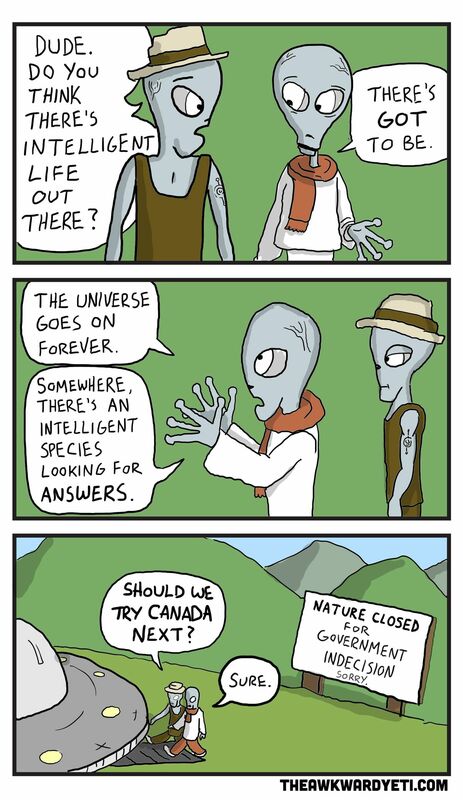 That’s a worst-case scenario, of course. NASA Administrator Charles Bolden was less dramatic at a space-weather conference hosted by the agency last week, though he did say such events can be “just as punishing as a tornado” and are “a problem that crosses all borders.” Magnetic storms can force Earth’s magnetic fields to go temporarily haywire, overwhelming power grids. From Aug. 28 through Sept. 4, auroral displays of extraordinary brilliance were observed throughout North and South America, Europe, Asia and Australia, and were seen as far south as Hawaii, the Caribbean and Central America in the Northern Hemisphere and in the Southern Hemisphere as far north as Santiago, Chile. Even after daybreak, when the aurora was no longer visible, its presence continued to be felt through the effect of the auroral currents. Magnetic observatories recorded disturbances in Earth’s field so extreme that magnetometer traces were driven off scale, and telegraph networks around the world—the “Victorian Internet”—experienced major disruptions and outages…. In several locations, operators disconnected their systems from the batteries and sent messages using only the current induced by the aurora. In other words, they literally ran the telegraphs from the electrical fields generated by the storm. The 1859 event may be an extreme case, but there are more-recent examples of such space weather: In March 1989 a geomagnetic storm took down northeastern Canada’s Hydro-Quebec power grid in just 90 seconds, leaving millions without power in the cold for up to nine hours. And a set of “Halloween” solar storms between October and November of 2003 sparked a National Academy of Sciences-led meeting on the societal and economic impact of space weather, which served as the basis of the report. But it’s not just scientists who are concerned about space weather. Lloyd’s of London, the giant insurer, issued a report on the issue in 2010. In the foreword to the report, Lloyd’s Tom Bolt warned of a scientist-predicted spike between 2012 and 2015. “In terms of cycles, we are in late autumn and heading into winter,” he wrote then. A severe space-weather event could prove devastating, according to the Lloyd’s report. In the worst case it can permanently damage transformers. In most cases, systems protecting power grids will detect problems and switch off before serious damage occurs. However, this may lead to a cascade effect in which more and more systems are switched off, leading to complete grid shutdown. In these situations it will take many hours to restore grid operation, causing disruption to operations and services, and potential loss of income. The 1989 storm permanently damaged a $12 million New Jersey transformer. In 1921, a storm 10 times as bad struck. Today, that storm would permanently damage roughly 350 transformers, causing blackouts that would affect as many as 130 million people, according to a Metatech estimate. 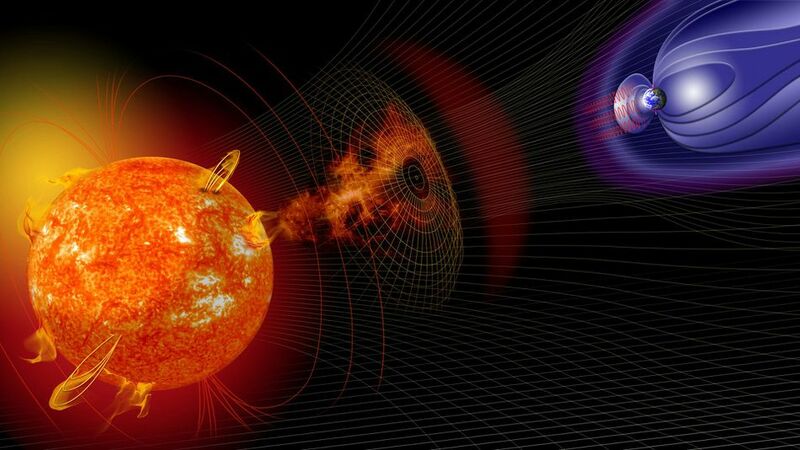 An outside analysis conducted by Metatech for the Electromagnetic Pulse Commission and the Federal Emergency Management Agency found that the effects of a severe geomagnetic storm would not only be widespread, but long-lived. Such an event has “not only the potential for large-scale blackouts but, more troubling … the potential for permanent damage that could lead to extraordinarily long restoration times,” Metatech’s John Kappenman told the NAS report’s authors. In a globalized world, all kinds of sectors would be impacted by a power failure. Fuel, food, water, sanitation, communications, medical/health, finance, and transportation would all feel cascading effects. Many businesses rely solely on satellite navigation for transportation on land and sea, and cell phones would be vulnerable to interference. “Impacts would be felt on interdependent infrastructures, with, for example, potable water distribution affected within several hours; perishable foods and medications lost in about 12-24 hours; and immediate or eventual loss of heating/air conditioning, sewage disposal, phone service, transportation, fuel resupply, and so on,” the NAS report found. Hurricane Katrina caused roughly $80 billion to $125 billion in damage, according to the report. A future geomagnetic storm like the 1859 event could cost 10 to 20 times as much and take up to a decade to fully recover from, according to Metatech’s estimates. It’s possible that most people on Earth have never seen the Milky Way, the galaxy in which we live. The Milky Way used to be a part of every human’s life experience, but now that the majority of mankind lives in cities, with their light pollution, the Milky Way is rarely seen. Our Milky Way galaxy is at its best for the next couple of weeks, but most of you will need to make a special effort to see it. It will probably require a drive of an hour or more to reach a dark enough location, where the Milky Way will be visible. Then it will require another 20 minutes for your eyes to become adjusted to the dark. What will you see? Not the brilliant array of stars you see in photographs made with long exposures. The real Milky Way looks like a faint band of moonlit cloud arcing across the sky. Your eyes cannot resolve it into individual stars. The final clue to the puzzle was the realization that stars were all grouped into huge islands called galaxies, each containing many billions of stars. The Milky Way is our local galaxy. Even today, beginners in astronomy often get confused by the two meanings of “Milky Way.” It can be used in its original sense to refer to the faint band of glow arching across the sky, or in its modern sense referring to the galaxy in which the sun resides. When amateur astronomers refer to the Milky Way, they usually refer to the faint band in the sky, although any time you look anywhere in the sky, all the stars you see are part of the Milky Way because we are in the Milky Way. But wait! Don’t try to spot the Milky Way tonight, because there is still an almost full moon in the sky. Wait a few nights until the moon has moved on in its monthly trip around the Earth. When you get to your dark night sky, you may still need to block any nearby lights from your view. Then you will need to wait about 20 minutes for your eyes to adapt to the dark. Then, look towards the south in the sky. If you live in the Northern Hemisphere, the center of the Milky Way will be low in the southern sky, and the band of the Milky Way will sweep upwards in an arch across the eastern sky to the northern horizon. If you live in the Southern Hemisphere, the center of the Milky Way will be almost overhead, and the band will sweep from your sothwestern horizon to your northeastern horizon. Look for a faint silvery or milky cloud. Some parts will be brighter than others, giving a faintly mottled effect. These are star clouds, concentrations of millions of stars too faint to see as individual stars. You may also see some “holes” in the Milky Way: clouds of interstellar dust blocking our view of the stars beyond. If you have a small binocular with you, say a 7×50 or 10×50, you can recreate Galileo’s discovery that stars make up the “glow” of the Milky Way. Even that small amount of magnification will be enough to resolve the Milky Way into thousands of stars. 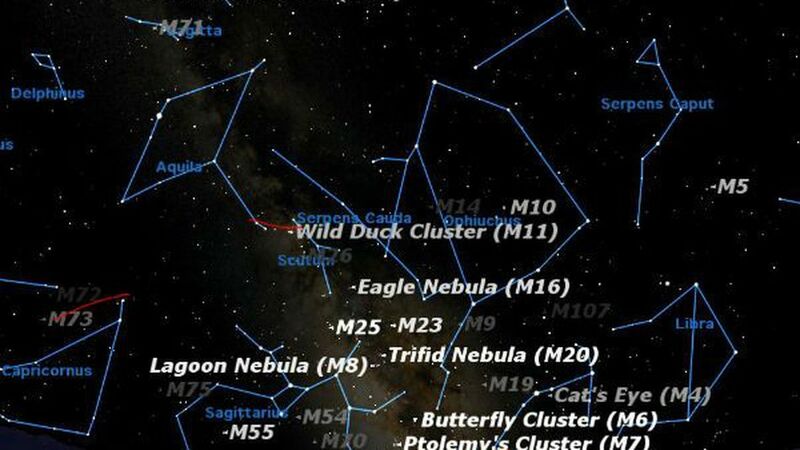 Start your tour of the Milky Way by looking for the constellations Scorpius and Sagittarius. Unlike many constellations, these form clearly recognizable patterns. Scorpius looks like the scorpion it’s named for, complete with long curving tail with stinger at the end. Its heart is marked by the red giant star Antares. Sagittarius looks nothing like a centaur archer, but rather like a prosaic teapot, complete with handle, spout, and lid. If you live in the north, you will find these low in the southern sky. If you live in the south, they will be almost overhead. Because the center of the Milky Way is the richest part of the sky, it is crammed with nebulas and open star clusters. To give you some idea of this richness, the chart shows the names of some of these objects. The brightness of the name indicates the brightness of the nebula or cluster. The brightest objects are gathered around the center of our galaxy, right on the border between Scorpius and Sagittarius, between the scorpion’s stinger and the teapot’s spout. But for now, don’t worry about the names. Just take in the rich clouds of light as you sweep upward from Scorpius and Sagittatius (in the Northern Hemisphere) or either left or right from overhead (in the Southern Hemisphere). You don’t need to put a name to sheer beauty. 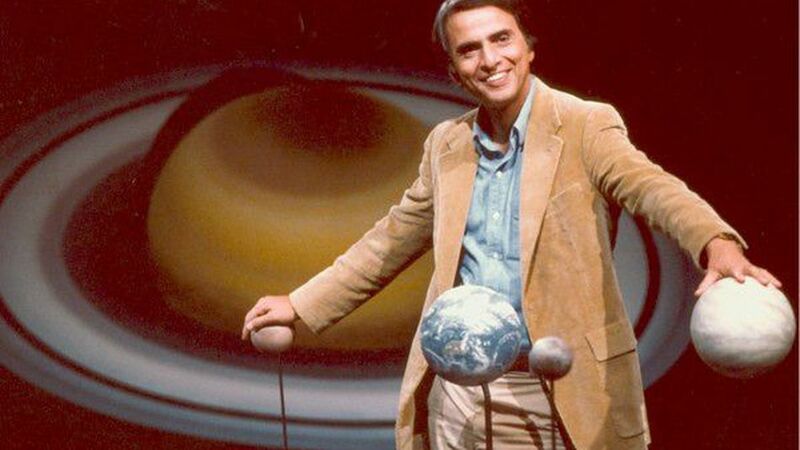 Carl Sagan’s passion for astronomy made him one of the most respected and celebrated space geeks of the 20th century. The science legend’s enthusiasm for exploring worlds beyond our own began as a child growing up in Brooklyn. At age 5, Sagan began frequenting the New York Public Library to browse books that could give him a better understanding of the stars. He later reflected on the what he discovered: “There was a magnificence to it, a grandeur, a scale which has never left me. Never ever left me.” The experience got him hooked on outer space. Sagan’s fixation continued and as a pre-teen he sketched his vision for the future of interstellar space exploration. The drawing featured newspaper headlines he predicted would happen in the future. The Library of Congress recently shared a digital copy of the drawing, along with a couple other gems you can view in the gallery below. 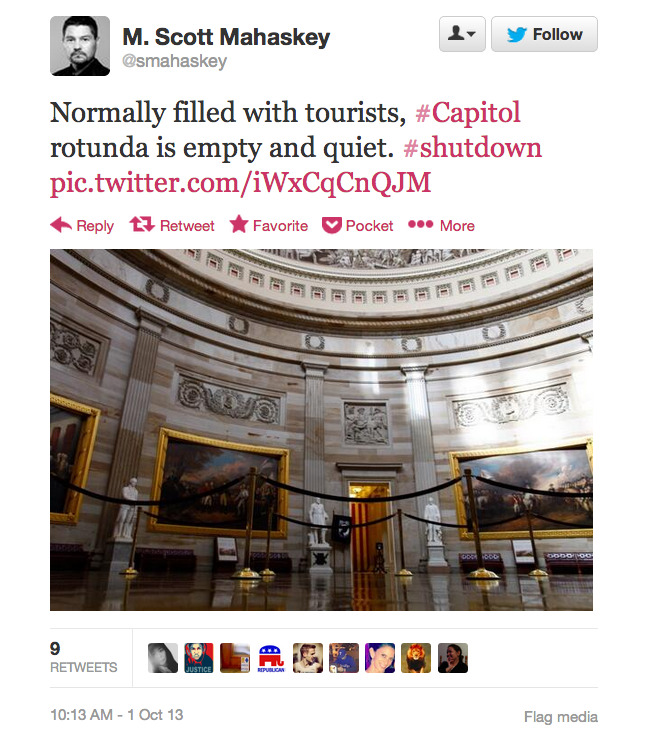 While furloughed employees may seem to be getting the brunt of the government shutdown, our neighbors to the north are also feeling the backlash — and by north, we mean waaay north. 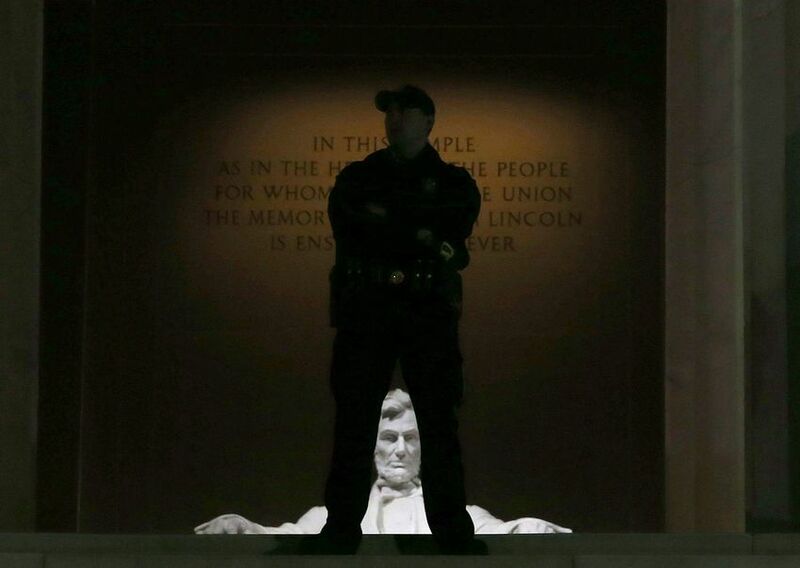 In this comic, artist Nick Seluk from The Awkward Yeti imagines that our favorite space-dwellers are wondering what’s up with all the empty tourist spots in Washington, D.C.
A U.S. Park Police officer stands guard at the Lincoln Memorial in Washington, D.C. 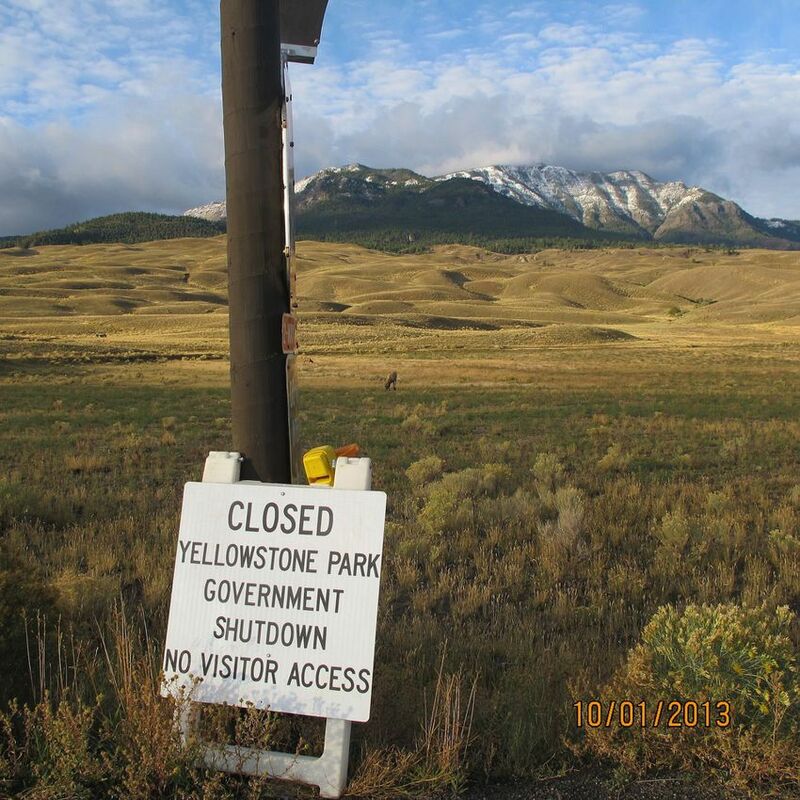 The first of the nation’s national parks did not escape the government shutdown. 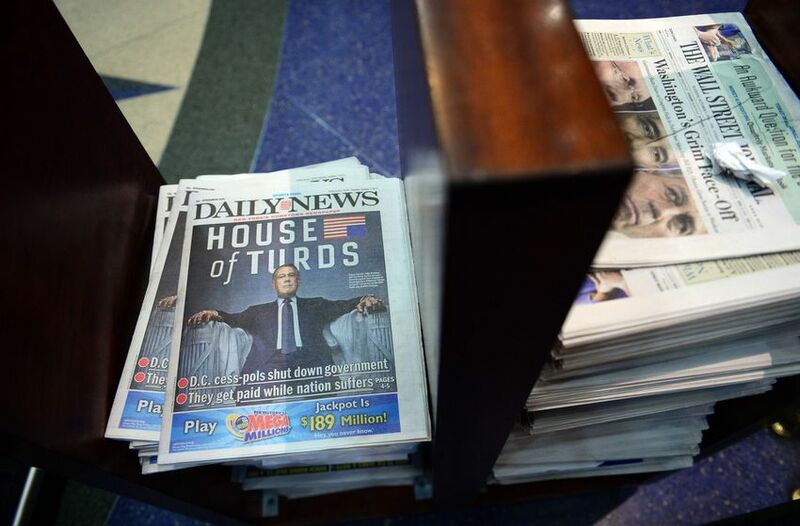 Congress’ inability to strike a deal captured all the morning headlines. Some were more creative than others. 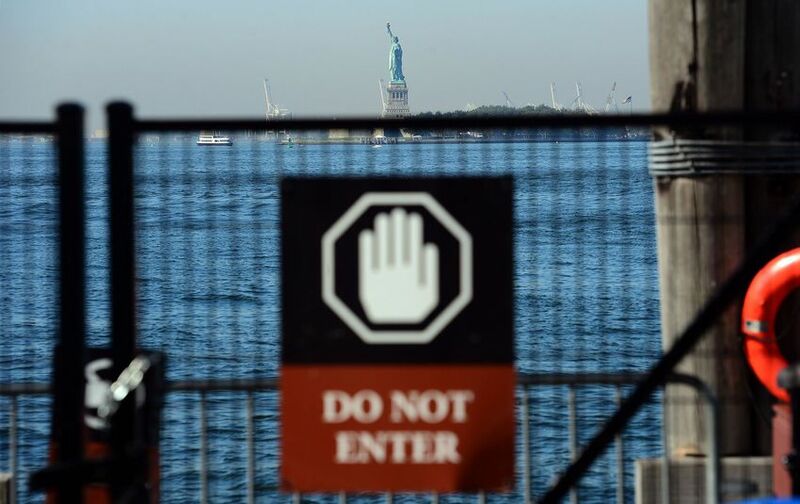 The shutdown closed the gates on Lady Liberty. 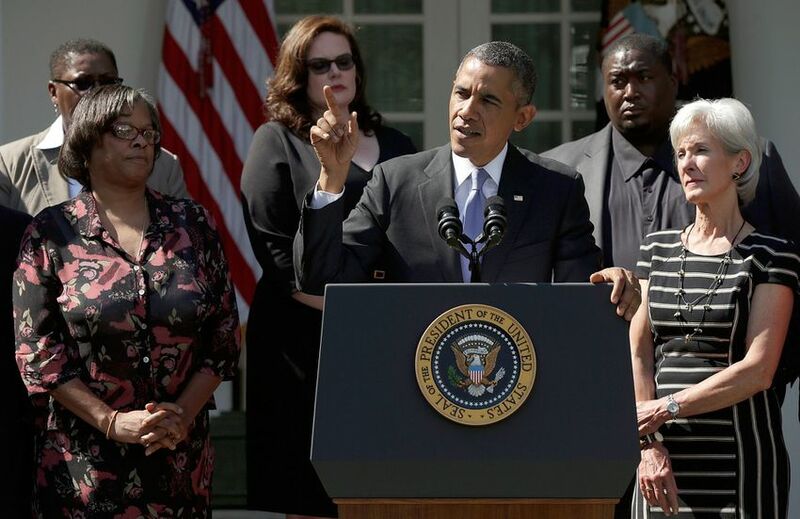 Flanked by residents who’ve benefited form the new health care law, President Barack Obama urged Congress to end the shutdown during a mid-day press conference in the White House Rose Garden. 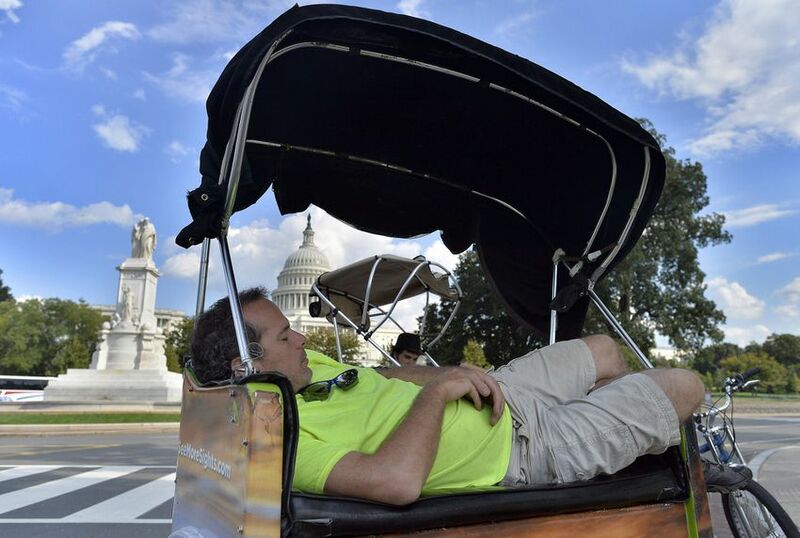 This rickshaw driver usually makes his money taxiing tourists between attractions in Washington, D.C.
Politico photo editor M. Scott Mahaskey tweeted this photo of the empty rotunda inside the U.S. Capitol. 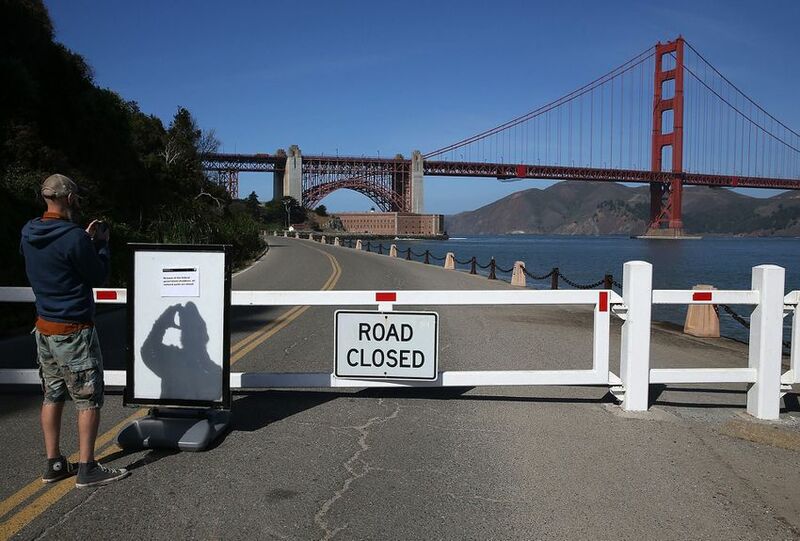 Even in the shadow of San Francisco’s Golden Gate Bridge, the Fort Point National Historic Site could not hide from the shutdown. 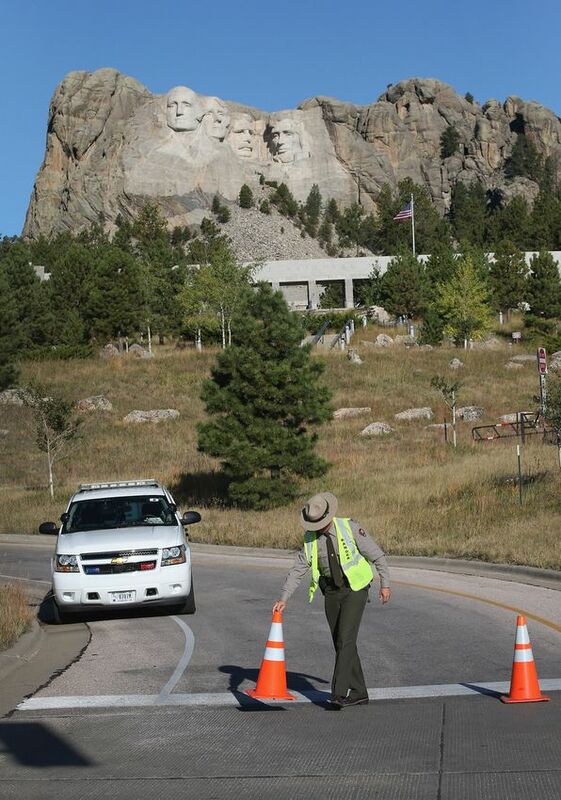 Mount Rushmore will remain closed during the shutdown. 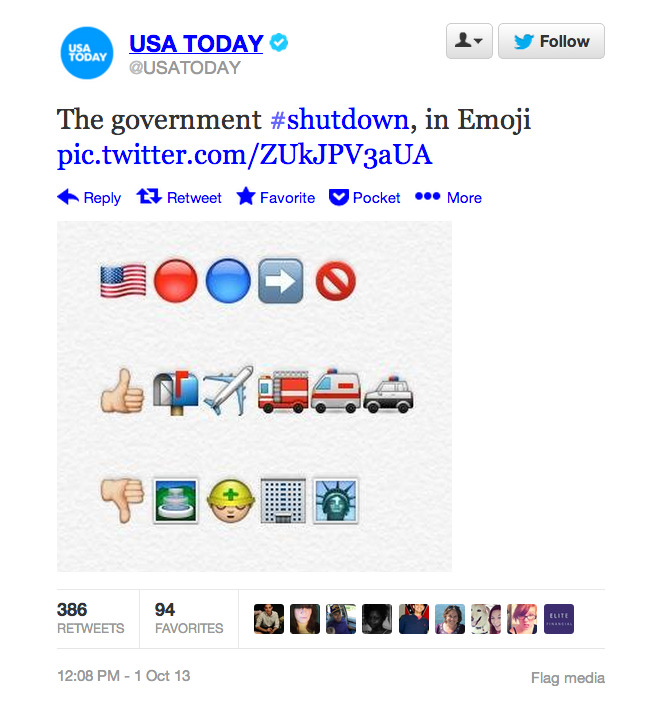 Here’s a creative emoji visualization of the shutdown by USA Today — thumbs up for services unaffected by the shutdown, thumbs down for those that are closed. 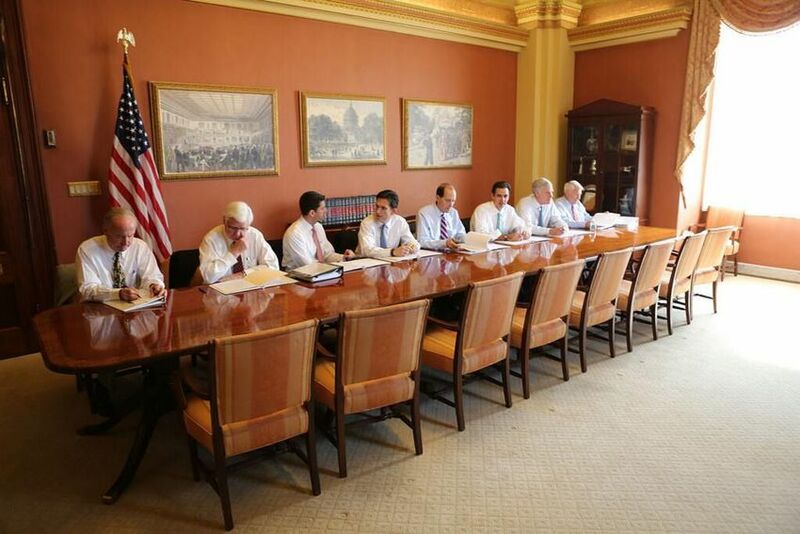 House Majority Leader Eric Cantor provoked Senate leaders when he tweeted this photo of himself and his Republican colleagues waiting at the negotiating table. 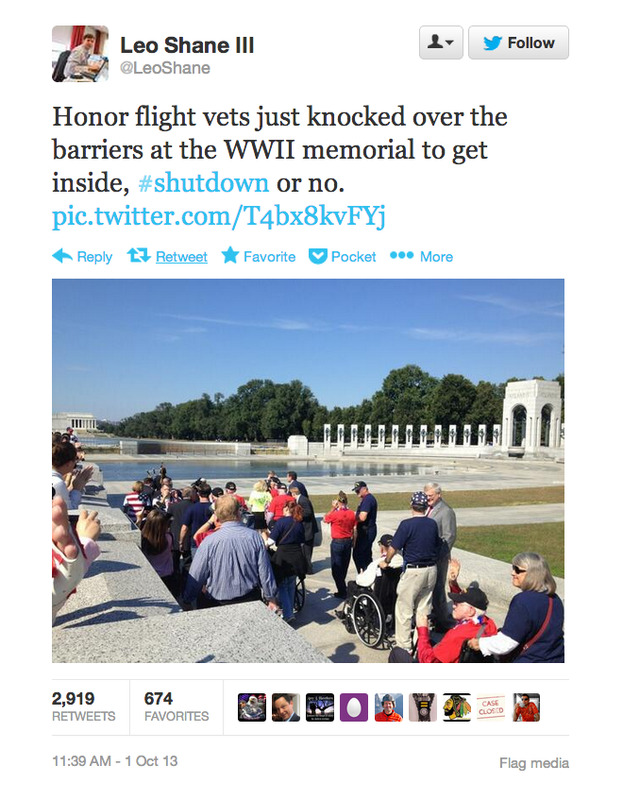 A U.S. Park Ranger barricades the World War II Memorial in Washington, D.C.
As Leo Shane III of Stars and Stripes showed us in a series of tweeted images, veterans managed to access the World War II Memorial, despite its closure. 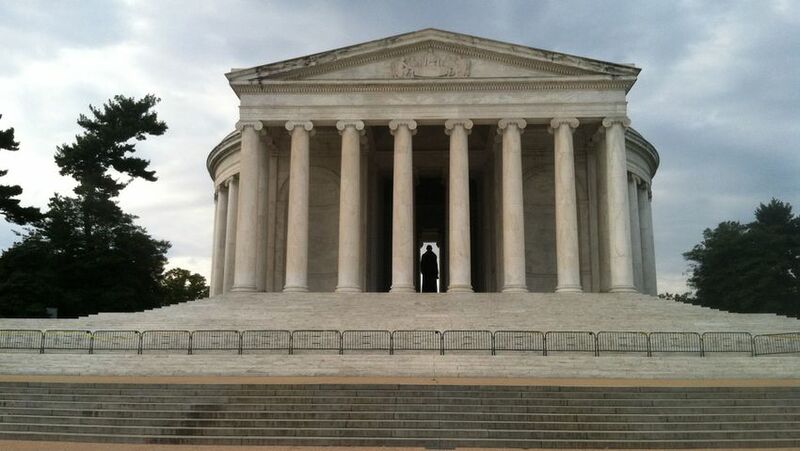 Thomas Jefferson may have authored the Declaration of Independence, but that didn’t spare his memorial from the shutdown. 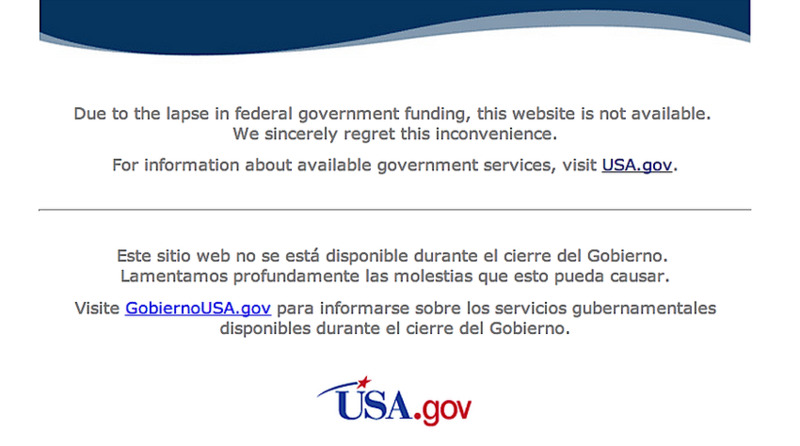 A number of federal agencies, such as NASA as seen in this image, took their websites down during the shutdown. 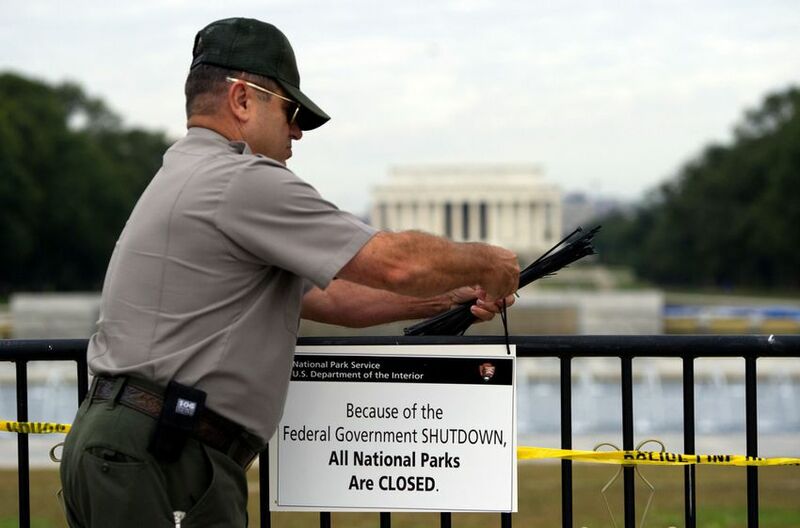 Even though a disagreement over Obamacare caused the shutdown, the law’s online marketplaces opened today and remained operational, despite technical difficulties. “There is hope,” Harold “Sonny” White of NASA’s Johnson Space Center said at the 100 Year Starship Symposium, a meeting to discuss the challenges of interstellar spaceflight. There is only one photograph of Neil Armstrong walking on the moon, and in it, he has his back to the camera. The first man to set foot on a planetary body other than Earth was not camera shy. It was just that for most of the time he and Buzz Aldrin were exploring the moon in July 1969, the checklist called for Armstrong to have their only camera. When the news broke Saturday that Armstrong, 82, had passed away, it is likely that many people’s memories of the first man on the moon were of black and white television images or color film stills. If they did recall a photo captured during the Apollo 11 moonwalk, it was almost certainly one of Aldrin, whether it was of him saluting the flag or looking down at his bootprint. In fact, perhaps the most iconic photo taken of an astronaut on the surface of the moon is also of Aldrin. 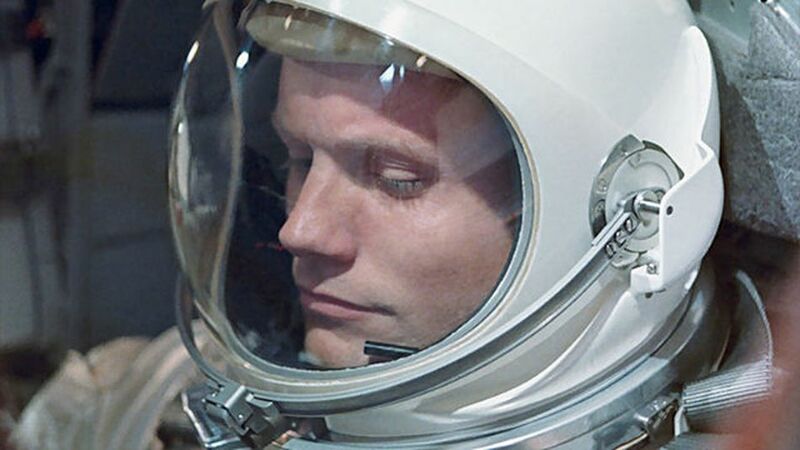 A posed shot, he is facing the camera with the reflection of his photographer, Armstrong, caught in Aldrin’s golden helmet visor. Of course, there were photographs taken of Neil Armstrong at other points during the moon flight, and on his previous mission, Gemini 8. Cameras were ready when he was named an astronaut seven years before walking on the moon, and were more than ever present after he returned to Earth as a history-making hero. To help illustrate that record, collectSPACE.com asked RetroSpaceImages.com to search its extensive archives of NASA photographs and pick out those that showed the Armstrong that the public didn’t always get to see. The three dozen photos they chose have been presented chronologically, with one exception: The gallery begins with the rare photo of Neil Armstrong walking on the moon. Where are space shuttle Atlantis’ launch director and mission management team today? Continue reading at collectSPACE.com.